Juventus have announced that Martin Caceres has officially rejoined them and could feature against Atalanta in Wednesday’s Coppa Italia clash. The Uruguay international rejoins Juventus for his third loan spell in Turin after struggling for game time at Lazio. Caceres has been brought back into the fold at Juventus after Medhi Benatia completed his €8m transfer to Qatari club Al-Duhail SC on Monday. The Serie A champions confirmed on their website that they’ve agreed on a five-month loan deal for Caceres and will pay Lazio €600,000 for his services. Speaking in a press conference earlier today, prior to confirmation of Caceres’ arrival, Allegri hinted that he could be thrown straight into the team for Wednesday. “Benatia has officially left,” said Allegri. Giorgio Chiellini, Daniele Rugani and Joao Cancelo are all set to start for Juventus on Wednesday with Caceres’ versatility as a defender putting him in contention to take on the left-back role. However, Allegri is refusing to get distracted ahead of Juventus’ game at Atalanta despite today’s good news. 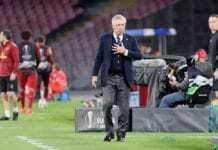 The Italian coach is also aware of the hype surrounding their upcoming Champions League clash with Atletico Madrid, but refuses to dwell on it. “I am always hearing about Atletico,” continued Allegri. “It is a football match, it is not confirmed that Juventus are the clear favourite. “We talk as if Juve are just waiting until June 1 to win the Champions League. This is crazy stuff and not a good way to think about the Champions League. It is our goal to win it and, if we are good and we are lucky, we can progress. “Playing against Atletico is not like playing against any other team, it is a game where there may be unexpected events that become normal. “In the league, it’s different because there are 38 games and you can miss one. [In the Coppa or Champions League,] there is no opportunity to respond. You have to play a great game and be lucky, there’s nothing else. The Atalanta and Juventus quarter-final match will begin at 20:45 (CET) on Wednesday night in Bergamo.